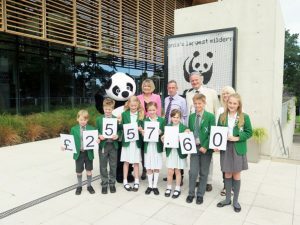 BREWERY Road-based WWF-UK received a welcome £2,500 donation from the ‘Diamond House’ team at St Andrew’s School last Thursday morning at the group’s Living Planet Centre HQ. The generous donation was raised through a school sponsored bounce on a bouncy castle. The proceeds will go towards WWF’s conservation work. St Andrew’s pupils are regular visitors to WWF-UK’s award-winning Living Planet Centre in Woking. According to Alison, this shows that young people care about environmental issues and want to take positive action to help. diversity of our planet while connecting young minds with solutions to global problems.